What Is Really Driving Up the Cost of Multiple Myeloma Treatment? Cost drivers in the care of multiple myeloma include hospitalizations and outpatient services, not innovative therapies alone. 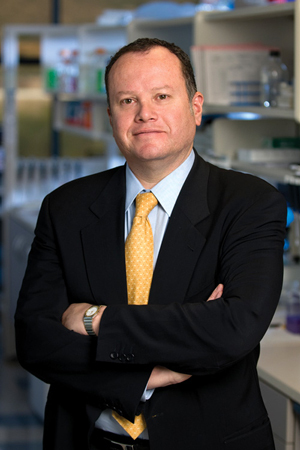 RAFAEL FONSECA, MD, MYELOMA EXPERT AND CHAIR OF THE DEPARTMENT OF MEDICINE AT THE MAYO CLINIC IN ARIZONA, AND COLLEAGUES DISCOVERED THAT COST DRIVERS IN THE CARE OF MULTIPLE MYELOMA INCLUDE HOSPITALIZATIONS AND OUTPATIENT SERVICES, NOT INNOVATIVE THERAPIES ALONE. Over the past decade, treatment advances in multiple myeloma are helping patients live longer, better lives. But many doctors are concerned that those advances have made treatment unaffordable for some patients. Leading up to this year’s American Society of Clinical Oncology (ASCO) meeting, oncologists are learning that might not be the case. Since 2000, outpatient services and inpatient admissions have driven more of the total cost increases for multiple myeloma treatment than new therapies, according to a study published earlier this year in Leukemia. 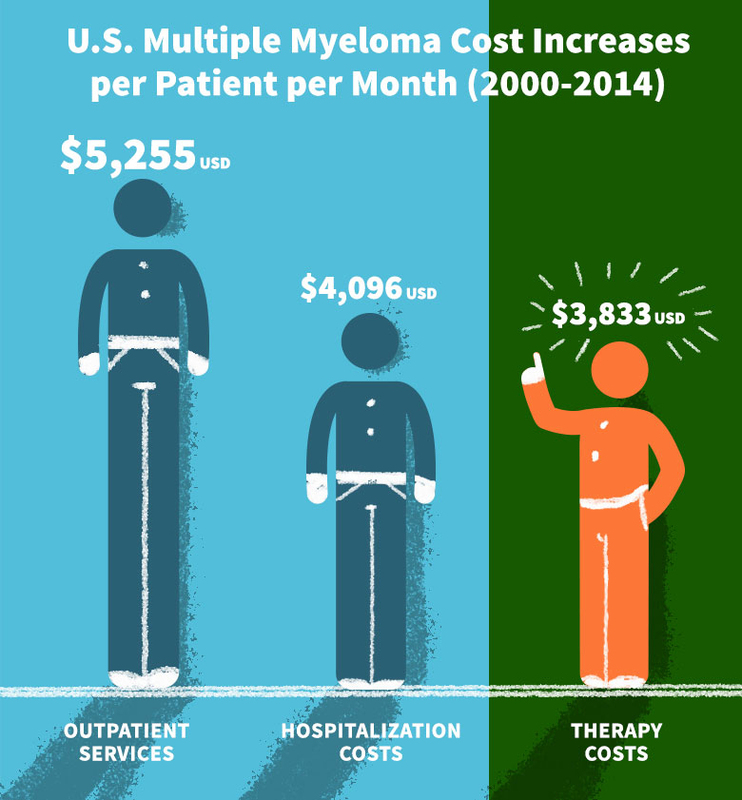 One of the primary drivers of the cost increases for multiple myeloma care is outpatient services, which increased by $5,200 per patient per month from 2000 to 2014. This rise was fueled by an increased use of imaging technologies, diagnostics and other tools needed for the care of myeloma patients. Meanwhile, hospitalizations and prescription medication costs increased by $4,100 and $3,833, respectively, due to increased utilization of stem cell transplants and other new therapies. Fonseca and his co-authors dug deep into “real world” data from the Truven Health MarketScan Research Databases and Medicare Supplemental Databases. Those databases provide information about what is paid for health services and medications, including rebates and discounts that insurers and pharmacy benefit managers receive. In contrast, conversations about treatment-related costs often focus on list prices rather than actual prices negotiated by insurers, according to Fonseca. Of course, the study’s data had some limitations. For instance, it only included people with commercial health coverage or private Medicare supplemental coverage, so the results may not apply to people with other or no health insurance. Also, the identification of multiple myeloma patients relied on diagnosis codes, which may not always be accurate or complete. At the Mayo Clinic, Fonseca treats patients from all walks of life and some on fixed incomes. Most of his patients ultimately get the care they need because their health insurance or Medicare help with the costs and foundations like the Leukemia and Lymphoma Society provide additional copay support. Even though some patients needed help with their efforts to secure financial assistance, Fonseca does not remember a single instance in his practice where a multiple myeloma patient couldn’t access their treatment because of cost. That is not to say it never happens, but at least not for his practice. “Commercially insured patients get a fixed maximum copay, Medicare patients receive support from foundations, and we can obtain free medications for uninsured patients,” Fonseca said. Without an objective analysis, the community risks perpetuating the narrative that patients can’t afford treatment. I would argue that’s not true in most cases. The false narrative that cancer therapies are unaffordable to patients can have very negative consequences. Fonseca knows the stories; one oncologist in Arizona feared treatment might be a financial burden for one newly diagnosed myeloma patient and his family, so he sent that patient to hospice instead. That narrative has also given credence to the increased use of strategies like prior authorization and specialty tiers that insurers and pharmacy benefit managers use to reduce costs by restricting or discouraging the use of medications. But many of these strategies, which are not guided by clinical evidence, affect patient care, according to a recent ASCO policy statement. ASCO believes that these strategies should follow evidence-based clinical pathways.